A soaring, modern tower on the calm outskirts of Rincon de Loix, offering quiet entertainment in a convenient setting. Laze around the freeform pool, before enjoying fun-filled evenings in the lounge, a perfect setting to make new friends. This is the 5th time that we have stayed here and every time that we stay it gets better and better. OK it is Benidorm but you have to accept the fact that the place is not 5*. The food, the rooms and the people are great. If you want a nice hotel that is solid and gives you everything that you can expect from being in a decent hotel in Benidorm then this is for you. Unsure how people can give this a bad review, we always travel as a couple and have had nothing but good memories here. Travelled April 2017 as a couple. OK for what it is.. The staff at this hotel are fantastic and went out of their way to make us feel welcome... They really made the holiday for us. The rooms are a little tired and could really do with freshening up. Our room on the 3rd floor was very noisy so ask for a higher floor room. I do wish this hotel (and others) would police the sunbeds better... People should not be allowed to reserve their sunbed at 9am and leave their towels there when they're not in use! Towels should be removed of sunbeds left unattended for 2 hours or more! The food was very basic but I suppose this is not a hotel that you would come to if you wanted Michelin starred food. There are some positives and negatives but on reflection if you want a pleasant trip without breaking the bank then it is a good place to come. We have just got back from the Levante Beach Apartments and it really was the poorest apartment we have had a holiday at. Staff were rude, shouting and being awful to the children, a woman on reception called Sheila really was horrible, one night the all inclusive finished at 11.45, 15 minutes early because they couldn't be bothered to change the barrel of lager, they totally refused even though we pointed what time all inclusive finished. We had to pay a deposit which we didn't know about £60. You cant get a drink before 10am, sunbeds cant be put out before 9am or you get told off like a child and you have to go opposite the road for meals in the Levante Club. Food was repetitive and cold, although restaurant was very clean, but many people had stomach upsets, no entertainment around the pool either, and Sheila the the receptionist turned the music up really loud and in Spanish because someone had complained to her about something. They didn't do anything to want people to go back. The pool was cleaned 2 times in 14 days, night entertainment was in the Levanvte Club across the road, which was rubbish, and they had 200 Icelandic students who had graduated in the Levante Club who took delight in throwing bottles from there balcony on our children playing on the park. DO NOT TOUCH LEVANTE HOTELS ! Hotel and staff were lovely, we had two bed room. One large bedroom with access to balcony, one very small room, small kitchen and reasonable size living room area. Very Large balcony. Also use of facilities in levante club accross the road. Hotel is situated a few minutes from beach, next to pubs and bars, the triangle, the cellar, the white horse. Lovely little place to eat just round corner called Lollys, British couple whom make fresh british food was excellent. Lifts in this hotel are extremelly small, one of our group was in a wheelchair and it was difficult to get them into lift, but this was only negative for us and overall we had a lovely stay. What you get for what you pay is excellent. will go back. Just got back from a week at the Levante Beach Apartments. It was a good holiday, after the 12 hour delay at the airport. Our family group ranged in ages from 10 years old up to 68 and we all had a fantastic time. The apartment was lovely and clean, as was every part of the complex that we saw. The staff were very helpful, pleasant and polite and made us feel welcome from the moment we arrived. The location was great too, within easy walking distance of the superb beach and the many, many shops, bars and restaurants. 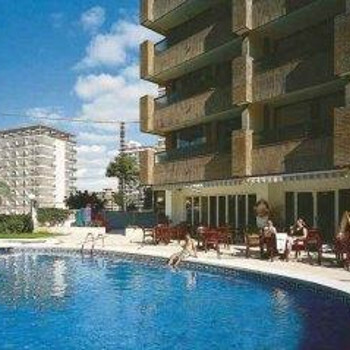 The apartments are self-catering, so there wasn't food available and there was no entertainment, but you don't need it onsite when you have a holiday in Benidorm ! The only bad thing about our holiday was that it came to an end!! Can't wait to go back. Had a Studio which was basic but had all you needed, clean and full oven with four hobs if you are into cooking more than eating out. Reception area very relaxing. Apartments just up road from a group of bars to our liking. Only about a Ten minute walk to thick of bar area. Pool and adjacent area kept clean and Tidy apart from kids littering place by late afternoon. Certain areas of the poola area got sun more than others due to adjacent apartments/hotels, usually a good Four to five hours could be had though. I read all the reviews on this site, and thats why I booked this Apartment. Excellent Location and apartments. Dont book a car theres no where to park. Not keen on Benidorm far too Blackpool with Sun. Train station is a good hours walk, but worth a cheap train ride.